It took a few months, but 2017 finally has its first good grindcore record. You know what? No, that’s a disservice to “Trumpeting Ecstasy,” the latest record from the Maryland-based quartet Full of Hell. It’s certainly true that it’s been a tepid year for the genre thus far, but even if that wasn’t the case, “Trumpeting Ecstasy” would still stand out. This is far more than just a “good” record: “Trumpeting Ecstasy” is a tightly written and astonishingly creative grind tour de force that offers more than a few moments of genuine artistic brilliance and is sure to catapult Full of Hell to the forefront of the genre. The record’s defining strength is its seamless mixing of grindcore’s blitzkrieg speed with the slower, particularly crushing elements of drone, doom and noise metal. Though “Trumpeting Ecstasy” constantly treads the fine line between rampaging aggression and more measured metallic buildups, the album never veers off course during its 23-minute runtime. Of course, this type of genre mashing is hardly unheard of, but few bands manage to find such a perfect balance of varied influences and overall pacing. Don’t be mistaken: This is still furious and violently raw grindcore at its core. The key is that while Full of Hell is no less vicious than their contemporaries, “Trumpeting Ecstasy” also champions diversity and experimentation in one of metal’s more traditionally rigid musical categories. Downtime is nonexistent, but the frequent tonal shifts and stylistic depth demand the listener’s undivided attention, despite the unerring insanity. For most albums, this would result in a disjointed and uneven listen, but every aspect of “Trumpeting Ecstasy” runs so smoothly that it just sounds natural. Although it may take multiple listens to fully absorb the record’s vast intricacies, the focused songwriting and frenzied tempo, paired with the disc’s breezy duration, make for an impressively discernible listen. The vocals, which rapidly alternate between feral death growling and the more traditional high-pitched screams, take center stage and are savage even by the genre’s extreme standards. Thankfully, the rabid snarls and shrieks still allow considerable room for the instrumental carnage to shine. 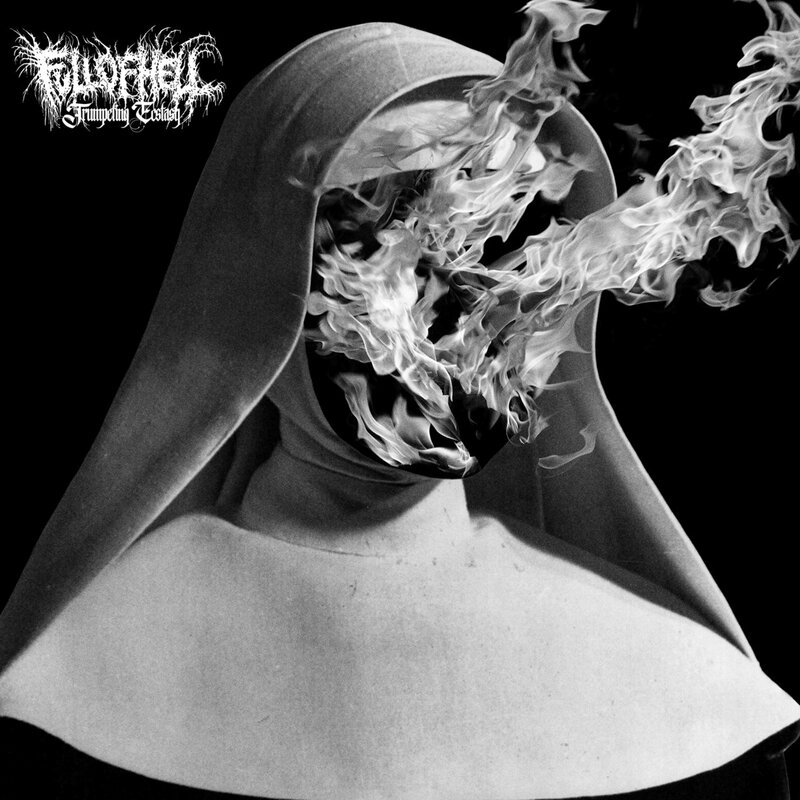 Full of Hell’s guitars and drums sound more like chainsaws and atomic bombs, and while the relentless brutality of the music is expectedly forbidding, the impressive range and animated delivery of both the vocals and accompanying instruments does wonders to stave off any potential weariness. All of this said, and I’ve still yet to mention the record’s defining pieces. “Trumpeting Ecstasy’s” title track and “At the Cauldron’s Bottom” constitute nearly half of the record’s runtime and close things out on an unbelievably high note. There’s nary a moment of noticeable weakness here, but “Trumpeting Ecstasy’s” final two tracks take things to another level. The massive title track is an apocalyptic culmination of the record’s myriad influences that is all but assured a spot in grindcore’s Hall of Fame, its glacial pace notwithstanding. Guest vocalist Nicole Dollanganger’s haunting cleans—the only ones on the record—are a beautifully stark, shiver-inducing contrast to what is otherwise a torrent of wickedness. Though the record’s slowest song by a significant margin, “Trumpeting Ecstasy’s” pulverizing heaviness and thick, maddening atmosphere absolutely envelop the listener while remaining absolutely faithful to the band’s core sound. “At the Cauldron’s Bottom” accelerates things with a frantic opener, but never aims to reacquire the record’s breakneck momentum. There’s no ecstasy here: Just ghastly inevitability, as agonized screeching and macabre grinding slowly gives way to more gradual doom riffing and a stunning drum outro. That such slow, droning tracks not only match the rest the record’s depraved intensity, but also sound like its only natural conclusion, is a grand testament to Full of Hell’s mastery of the genre. This is the stuff that classics are made of. Perhaps a few months’ time will tell if “Trumpeting Ecstasy” is one of the genre’s modern landmarks, but the signs are there. Admittedly, “Trumpeting Ecstasy” doesn’t always hit the phenomenal standard set by its final two tracks and “Ashen Mess” is a slightly overlong near-miss. But then you realize that the record’s two tracks are a substantial portion of the overall record, the rest of which comes so remarkably close in quality that it’s practically a nonissue. Then you start to think about how so few bands can fuse so many musical inspirations together into a cohesive package. Some, for sure, only a rare few approach this standard of excellence while producing something that is anything other than “standard.” Also, you’ve listened to the record seven times in a row and instead of approaching fatigue, you’re finding new bits and pieces to enjoy and are discovering untapped potential in a decades’ old genre. If that’s not a sign of a classic record, then I don’t know what is.